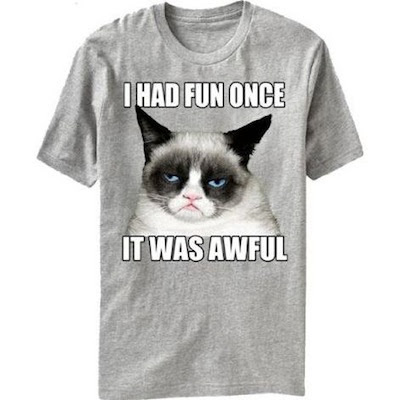 Catsparella: Win Your Choice Of A Grumpy Cat, Soft Kitty, Cat in the Hat, or Felix the Cat T-Shirt From TVStoreOnline.com! 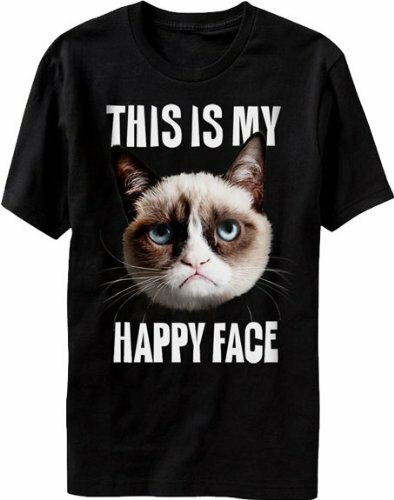 Win Your Choice Of A Grumpy Cat, Soft Kitty, Cat in the Hat, or Felix the Cat T-Shirt From TVStoreOnline.com! Where else are you going to find Game of Thrones and Arrested Development shirts (Call Me Maeby!!!! ), A League of Their Own costumes, and an Amy Winehouse wig and tattoo set? TVStoreOnline.com of course! The site was launched in 2004, and has remained committed to offering the finest licensed merchandise on the market, including t-shirts, costumes, and other cool accessories featuring some of your favorite tv shows, movies, music, comics, games, and more! Now y'all know how I think cats and pop culture go together like peas and carrots, so when they recently offered to give one of their culturally relevant kitty tees to one of my readers, I couldn't say no! 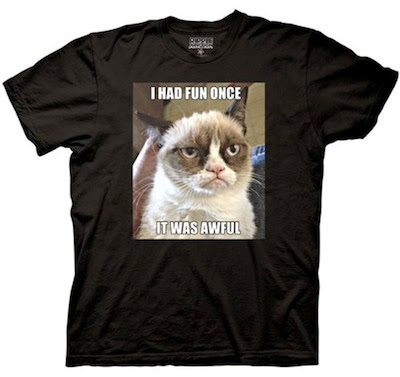 Choose from perennial favorites likes The Cat in the Hat and Felix, to modern classics like Soft Kitty from the Big Bang Theory, and Grumpy Cat! 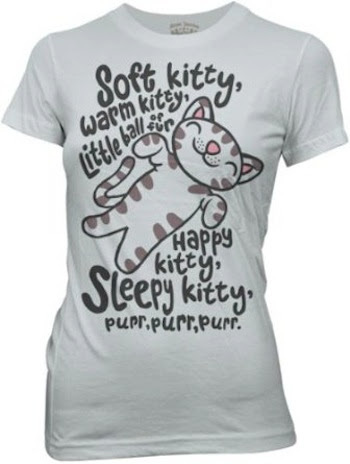 TVStoreOnline.com had generously offered one lucky Catsparella reader the chance to win the kitty-themed t-shirt of their choice! To enter, leave a comment on this post telling me your shirt choice, along with your name, and some way for me to contact you if you win (email, link back to your blog or profile, Twitter, etc.) The winner be will chosen in a random drawing next Tuesday, May 14 at 5:00PM EST. This giveaway is open to U.S. residents only. One entry per person, please. Good luck, and be sure to check out TVStoreOnline.com to check out their huge selection of tees and other merch.